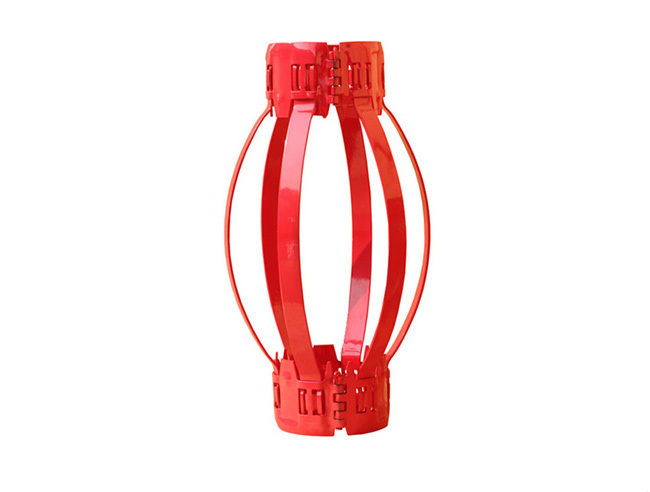 Hinged non welded bow spring casing centralizer is a simple, low-cost bow-spring design which can provide complete centralization in vertical or slightly deviated wells as the bow springs are slightly larger than the wellbore. 1.The non weld bow centralizers combine the highest restoring force with the lowest starting force. 2.High restoring force combined with low starting force is achieved with all bow heights. 3.The Bows of these Centralizers are heat treated in special furnace which gives it a peculiar ‘bow spring’ action. 4.The Heat Treated bows enables these centralizer to provide best centralization as well as help in faster running of casing. 5.The steel of these bows is a "special" made by combination or different metals to provide one of the best tensile strength as well as the "spring back" bow spring action. 6.The bows are available in a range to accommodate any well profile. 7.In this type of Centralizers the End Collars have hinges which makes it in two halves. 8.This enables them to be assembled at site. 9.The Hinged non welded bow spring centralizers are available in size 4-1/2" to 20". 10.Their installation on the casing pipe is very convenient.It requires only the placement of the two assembled halves on the pipe and inserting the pin in the end collar hinge. 11.The centralizer when unassembled makes a compact package, reducing the shipping cost. 12.Assembly at site is conveniently done.